This article describes how to read an Excel file that has merged columns within it. This article describes how to read an Excel file that has merged columns within it. 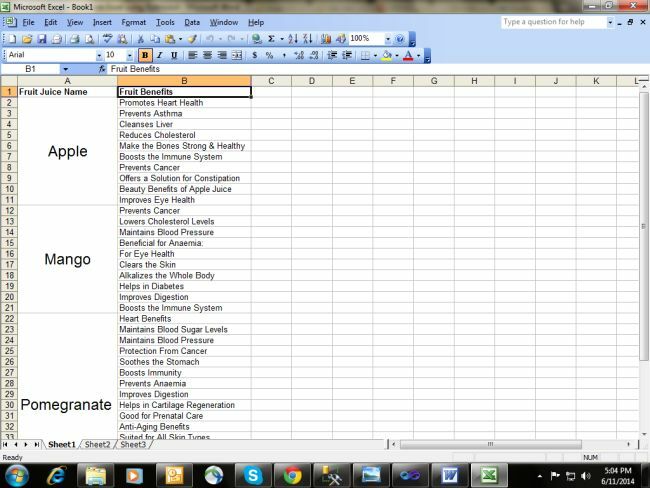 It's very simple and easy for us to read and upload an Excel file with normal columns and you'll find ample articles of that. But when you want to read an Excel file with merged cells then the way to do that is a bit way different. This was the requirement for me while working on a project, that we needed to import data from an Excel file having merged cells and place the data inside SQL without duplication and also properly formating the relationship among multiple tables, because the tables were highly normalized. Let's move towards creation of the Excel file. The following is the snapshot of it. As you can see I've multiple fruit names along with there benefits. For each fruit there are multiple benefits. 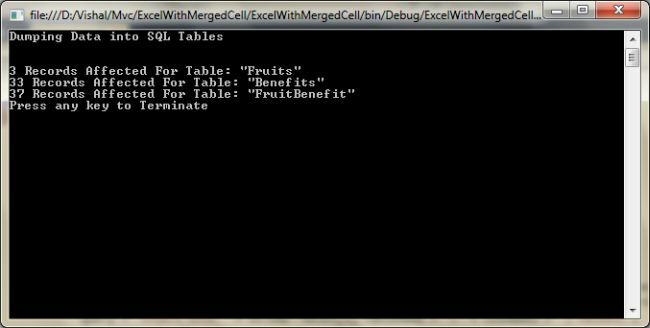 Now let's say you have tables in your SQL that store the name of the fruit, another table that stores the benefits offered and a third table that has the mapping of the fruit with that of the benefits. In that case you need to read the Excel file in accordance with your SQL table and also form the relationship with that of the benefits while reading. Also a special attention while reading must be taken about the duplication of the data, in other words no fruit or benefits should be duplicated and also their mapping. OK everything is now in place, the dilemma now is about how to read the Excel merged cell. Well to read an Excel merged cell it's simple, whatever columns are merged all form a range and we can get the data from that range. In simple terms we can say that only the first cell of the merged cell contains the data and the rest of them contain an empty string. Merging a cell doesn't mean that the cell does not exist, its exists but doesn't have a value. NOTE: For reading an Excel file we are using Bytescout.spreadsheet.dll. //iterate over the maximum row used withing the sheet. You can cross-check in SQL tables also.